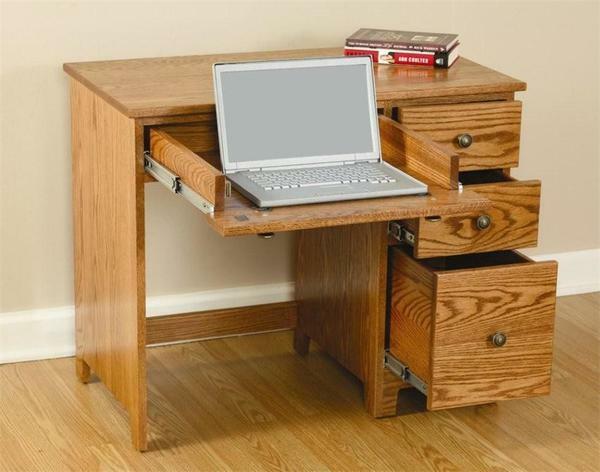 Are you in need of a desk to work at but are working with a small space? The Amish Berlin Economy Desk with Drawers offers just the right fit for a small office, bedroom space or dorm room. The Berlin measures 36" wide and 20" deep, offering just enough room for book, writing paper and laptop. There's one hanging file drawer to keep documents filed away smoothly, two storage drawers and one central drawer with a built in pullout to hold your laptop. There are cut-outs for wires in the pullout drawer to keep your work space neat and tidy.